Paul Seele, social democrat and previously trade unionist, lived in Berlin and had a friendship with the Jewish families Heimann and Herz, to whom he kept on supporting even after the repression had started. Mainly, he helped the daughter Liselotte Marquardt, who was born Heimann, when she was arrested in 1941 and was taken to the meeting place for the transportation to the concentration camps on Levetzow street in Berlin-Tiergarten. Immediately after the arrest of Lilo Heimann, he went to the company where she worked as an accounting employee to request for a brief liberation of her in order to ”transfer her work” to her successor in that function. With this certificate he went to the Gestapo and managed her liberation. The first nights he hid Lilo at his place and later she was temporarily housed by other acquaintances. 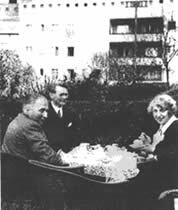 With Franz Marquardt´s help, who was his Party colleague, (who later married Lilo), Seele organized a hideout in an orchard in the outskirts of Berlin where she was able to stay until the end of the war. Paul Seele and his wife Erika also provided her with food and other supplies, even when after 1943 Seele was stationed as soldier outside Berlin. This way, Lilo Marquardt managed to hide for three and a half years in Berlin and survived.